If you have yet to be diagnosed with Plantar Fasciitis, but feel as if the soles of your feet have somehow turned into beds of broken glass, you’ll be at least relived when you find out there’s a name (and treatment) for it. It is one of the most painful afflictions of the foot there is. Sometimes it is concentrated in the heel, but it can also be the entire sole of your feet that hurts to the touch, and is excruciating to walk on. There’s a thick tissue band that runs across the length of your foot. The job of this band is to connect your toes to your heel. When that tissue gets inflamed, you get Plantar Fasciitis. It is most painful in the mornings after you’ve been sleeping and off your feet all night. When you take your first steps in the morning, it can be excruciatingly painful. As the day wears on, the pain can lessen, but not fully dissipate. It’s worse if you stand or work for long hours; and if you’re an athlete, it will prohibit you from running and working out. Speaking of runners, they are typical candidates, especially if they have tight calf muscles or Achilles tendons. People who stand a lot and don’t wear shoes with the proper arch support and foot cushioning are also susceptible, as are those with high or no arches (flat feet), or who roll inward as they walk (pronation). The best treatment is stretching, resting, and icing. You might need physical therapy to learn exercises that will help you to stretch your Achilles tendon and calf muscles and strengthen your lower leg muscles in order to stabilize your ankles and heels. In extreme cases, your doctor might prescribe a night splint, which is a type of boot that you wear when you sleep to help the muscles stretch during the night. Their brand promise is “The science of style” for a reason. They epitomize shoes with good arch support. They are technologically advanced and have a line certified by the American Podiatric Medical Association. It’s hard to match the design and comfort of this brand when you’re treating Plantar Fasciitis. They have many styles and types to choose from, which is one of the great things about them. They aren’t only a walking or therapeutic style option. From sandals, to all day in the office, to weekend adventuring, you can choose from literally hundreds of great looking shoes that will treat your feet in an ongoing fashion without a trip to the doctor’s office. If you’re looking for a stylish bootie to go with your wardrobe this Fall, you will love the Sterling. There’s a removable microfiber EVA orthotic insert, which will support and cushion your entire footbed as if you were prescribed custom-made orthotics. The outsole is made of rubber, and the uppers come in both suede and leather options. They contour to the shape of your forefoot and have a deep heel cup. The side zip and gore panel make them easy to put on but keep them secure to your ankle. These look great with any outfit and will help improve your pain with every step. This is a timeless, elegant classic. A pointed-toe flat with just the slightest heel, this beauty will give you the much-needed arch support you need in a dress shoe without sacrificing good looks. Vionic has constructed these with an extra wide toe box, so your toes aren’t smashed together or jammed into a point. They have the Vionic EVA orthotic insert, which is microfiber and removable. Their Orthaheel Technology is built into this shoe, supporting the alignment of your feet and ankles. And the best part, among many colors to choose from, their also offered in black, natural, and gunmetal snake; tan leopard; and gold cork. You’ll never want to take these off, and you can wear them with any outfit. This is a keeper for every man’s closet. Going out doesn’t mean suffering inside painful dress shoes. The Vionic line approved by the APMA will treat your plantar fasciitis and keep you looking and feeling professional, stylish, and polished. The Bruno is a staple for the smart wardrobe with the leather or suede uppers and protective coating that guards against weather and signs of wear. The outsole is long lasting, as it’s made from the toughest durable leather. The Orthaheel Technology keeps your feet aligned and treats your symptoms, and the leather covered EVA footbed is removable. These will support your feet and help protect against pronating. Recommended by doctors and physical therapists, Naot puts out an orthopedic line that has been treating people with plantar fasciitis for decades. Their signature footbed is make of cork and latex and is designed to anatomically conform to your feet. They break in gradually, and as they do, they hug the contours and support the arches and heels of your feet. Always on the recommended list, they are supportive, corrective, aligning, and stabilizing. And added bonus, they look great and offer myriad styles from sandals to dress. This is smart lace-up shoe that goes with any outfit and can take you from the theater to the sports bar in style. Naot’s signature suede enrobed cork and latex footbed conforms to your feet, and the more you wear them, the better and more comfortable they become. The sole contains a metal shank for anti-slip protection and stability, and the heel cup and tongue are padded for extra cushion and comfort. If you’re an oxford or classic flat type of gal, you’ll want to check out the Borasco. This is a feminine flat that looks great with a pant suit, dress, or jeans. I love this monkstrap style to pair with just about whatever look I’m going for. The comfort, support, and orthopedic features are major bonuses. The heel cup and tongue have extra padding and the sole, made of polyurethane, contains a metal shank for protection against slipping. The padded lining keeps your feet warm and absorbs moisture. When you’re putting your feet to the test with a lot of walking, whether on vacation, or on weekend urban hikes, you need to take special care to ensure your footwear has the essential features. Make sure your arches are supported, ankles and feet are in alignment, and the whole foot bed is cushioned. Asics, Brooks, and Vionic all have a firm foot hold in the best walker category for treating PF. The technology they build into the soles utilize what is called DuoMax and Trusstic. They’re designed specifically for stability and support in the soles of the feet, while the heels and balls of the feet are cushioned with gel. There’s both a women’s and a men’s version of this shoe, and the midsoles of each are tailored to the differences in feet between the genders. They are extremely lightweight and come in black or white. Brooks is well known for their running shoes, and they’re also a favorite of podiatrists. Because they’re built on such a stable (and stabilizing), supportive, and cushioned frame, Brooks was smart to move into other form factors. Namely, the walker. Their proprietary MoGo midsole is the ultimate in cushioning every step and that ever critical arch. This keeps the shock off your ankles and legs and supports that vital fascia on the soles of your feet. They have a slip resistant sole and built in support for stability against pronation. You can choose from traditional lace-ups or v-straps. This is a classic looking sneaker with the added benefit of Vionic’s orthopedic technology built right in. These will carry you for countless miles in comfort and will support your arches, heels, and footbeds with extraordinary cushioning. Designed by a podiatrist, the EVA midsole has an elevation of five degrees, which helps stabilize and guide the natural gait. There’s extra padding in the collar, and the removable orthotic has a deep heel cup and arch support for stability and protection against pronating. They’re approved by the American Podiatrist Medical Association and provide relief from all symptoms of Plantar Fasciitis–knee, arch, and heel pain. This is the classic Vionic walker and a fan favorite for many years. Designed and built with the seal of approval from the APMA, and their “Active Motion System” technology, these will absorb the shock of every foot fall and protect your arches and heels against painful symptoms associated with plantar fasciitis. The internal orthotic is medical grade, and the outsole is cushioned for added support. The uppers are breathable and lightweight, rendering the perfect all around therapeutic shoe that looks great and will last years. The EVA midsole five-inch elevation guides your step from heel to toe, and there’s a thermoplastic heel for additional support and stability to ward off pronation. New Balance has been creating a stable platform and sound architecture for many decades for runners, and now they’re doing the same for walking enthusiasts. And it’s now become common to hear doctors talk about New Balance footwear for plantar fasciitis. If it’s motion control and stability that you need to treat your plantar fasciitis, check this one out. Their ROLLBAR stability technology and ABZORB cushioning will give you the protection you need against pronation, and the compression EVA midsole is designed to cushion your entire sole and protect your inflamed fascia tissue. Check with your doctor about Medicare coverage. For orthopedic therapy and guaranteed all-day support and comfort, you should consider Skechers GOwalk for plantar fasciitis. Available for women and men, the GOwalk 2 delivers superb features that benefit those with the painful symptoms of torn fascia. They’re slip-on for easy on and off and great for travel. The OrthoLite sock liner is antimicrobial and preferred by those who like to go sockless. They employ what they call “V-stride” technology, which is a guiding mechanism, helping to keep the feet and legs aligned through the stride. They build in stability mesh siding for lateral support, and the midsoles are constructed with a memory enhancing Resalyte, so you get much-needed shock absorption. They are great for work if you have the option of going slightly more casual than formal. The ultimate work shoe for men and women, this one is the iconic standard. It’s a favorite for people who are on their feet all day–doctors, nurses, and those who work in retail and food service. It doesn’t get more therapeutic than the Dansko brand, and you can’t go wrong with the styling of the classic clog. The shank and footbed are made of polypropylene for flexibility, support, and shock absorption. Your heels move freely with every step and there’s more than enough room in the toe. Dansko has the seal of approval from the American Podiatric Medical Association. Beloved by men and women alike, they’re available in every color of the rainbow plus about a million. With its signature Gel cushioning system, these are a good option for runners who need protection against their plantar fasciitis. They have padding where you need it–in the heel–and adequate space in the toe box. You can remove the sock liner if you have your own custom orthotics. They have a rugged outsole for all terrains, and durable rubber that protects against any potential road or trail hazards. 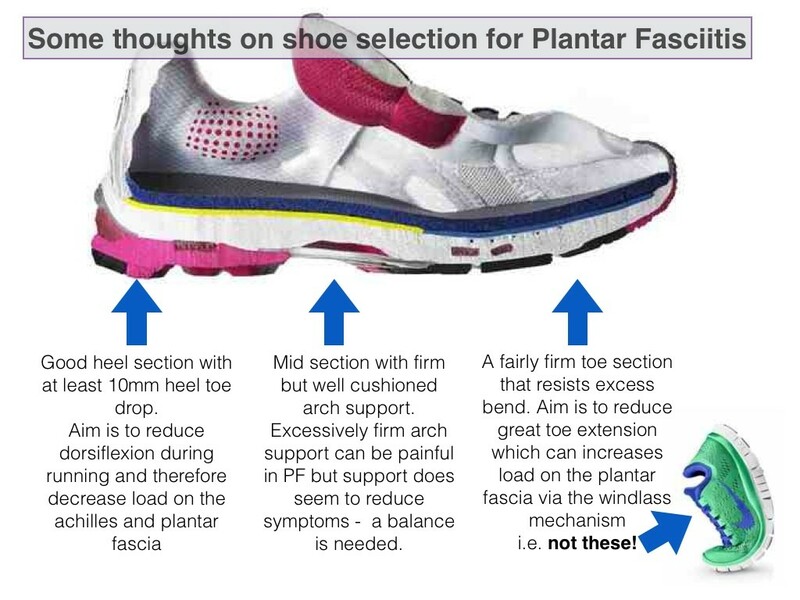 Read our full guide on how to find best running footwear for plantar fasciitis. The features that set these apart from others and makes it a superb pick for those suffering from PF is the incredibly sturdy heel, the flexibility built into the back of the soul, and the all inclusive cushioning. These combine to support your arches, guide your tracking, and help prevent against pronation. Available for both men and women, it’s also good for those suffering from Achilles tendonitis. Nike shoes haven’t always been synonymous with plantar fasciitis, but they are now. A favorite amongst runners who need arch support and stability control. The tapered outsole provides excellent traction, and the breathable upper, crafted from a breathable mesh keeps your feet cool. Well known for their orthotic inserts, the Spenco brand has a long history and great reputation for those with therapeutic foot needs. If you need extra support and incredible comfort, and you want a good looking flip-flop sandal to boot, the PolySort Total Support Yumi should be on your list. They have deep heel cups and extra cushioning, orthotic support for your arches, cushioning in the forefoot, and a metatarsal dome. They feature “full contact comfort” and “total support” technology in every piece of footwear they make, which makes for a great fit, support, and stability no matter what your foot size or shape. A relative newcomer, though it’s been almost ten years already, Olukai is firmly on the scene. They broke out the big guns with their line of comfortable, supportive sandals that provide comfort you can’t find in most brands. Quite possibly one of the best shoes for arch support, the ‘Ohana has become the iconic standard among the now huge inventory to choose from. And like the Dansko Professional, it’s destined to stand the test of time. The molded EVA midsole provides anatomically correct compression. The “ICEVA” footbed, if you’ve never tried a pair, will, ahem, knock your socks off (sorry!). It’s so soft that it seems like it must come from the planet of otherworldly soft materials. I’ve never felt anything like it. And it alone would win anyone over, but combine it with the support and comfort of the arch, and you won’t believe you’re wearing sandals, let alone sandals that help you with your plantar fasciitis.